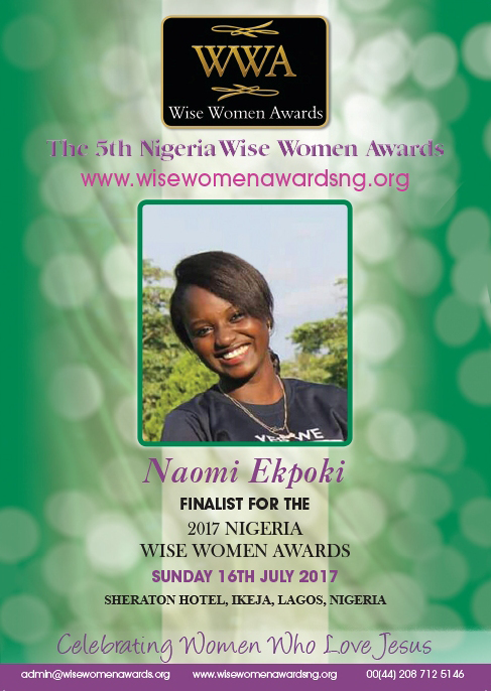 Naomi Ekpoki is a 19 year old, 400 level student of Engineering at Covenant University Nigeria. She started giving out scholarships at the age of 15 to children from financially challenged backgrounds and helping them get the resources they needed to go to school, she did this by seeking for donations from family members and friends. As she worked, she became increasingly disturbed about the lack of educational opportunities available to internally displaced, orphaned and vulnerable children. In wanting to reach out to them on a larger scale, she started the Senema Love Foundation. This foundation is aimed at providing quality education and helping children in such categories, go through school comfortably with all their needs met. She aspires to put an end to child poverty and she believes that every child has a right to good formal education. Her goal is to finally have a world where underprivileged children live free of poverty and have access to formal education, making positive impact on the society. Her organization gives out scholarships, pays the registration fees for national exams for children who cannot afford the fees, and provides educational materials for them. She has also conducted several outreach efforts to reach children in orphanages and other less privileged children in her community. Through her outreach efforts, she provides educational materials, food, clothes and other necessary items to the children. She also inspires other young people to be part of her work by taking some of them along with her for outreach activities. So far she has worked with over a 100 young volunteers in her organization. On several occasions she has volunteered at Internally Displaced People’s camps in her community, orphanages and children’s homes, she takes free mathematics tutorials for senior secondary school students in preparation for their final exams. She is also involved in raising a voice for girls of school age who suffer from VVF (Vesico Vaginal Fistula) due to early marriage or female genital mutilation. She has reached over 1300 children through her work, sponsored girls for their final exams (of whom are now enrolled in local universities) and raised awareness about the gaps in education for underprivileged children in Plateau and other states in Nigeria. She raises funds by selling of items such as branded t-shirts and drinks and also through the help of individual donors. All of this work she has been doing for the past four years, while also pursuing a University degree in Information and Communication Engineering. Naomi is a vibrant Christian and is passionate about taking the gospel of Christ to the ends of the earth. She plans to do more and have greater impact in years to come, thereby sharing the love of Jesus.